Adam Abel is a film producer. With Ryan Little, he started Go Films production company, which produced feature films Saints and Soldiers (2003), Saints and Soldiers: Airborne Creed (2012), and Saints and Soldiers: Into the Void (2014), Outlaw Trail: The Treasure of Butch Cassidy (2006), Forever Strong (2008), and Freetown (2015). Saints and Soldiers won best picture in more than fourteen film festivals around the world. Outlaw Trail won a Crystal Heart at the Heartland Film Festival in Indianapolis and Forever Strong won a Truly Moving Picture Award. 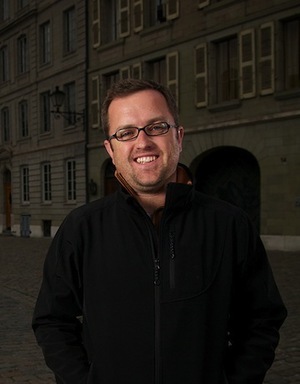 Abel has also worked as assistant director, location manager, production assistant, and unit production manager on such films as Brigham City, The Singles’ Ward, The RM, and PBS shows "Ancestors" and "The Call of Story". Go Films also produces commercials and public service productions. His PSA "Swashbuckler" won a 2009 Best PSA Award. Abel was born on September 9, 1976. While on a high school tour at Paramount Pictures, he had the idea to later send his résumé to the man who gave them the tour and ask him to distribute it. That effort garnered him an unpaid internship, which quickly turned into a job in the creative affairs office. He later studied business at both Utah Valley University and Brigham Young University while freelancing. He earned his bachelor’s degree from UVU. He was the original producer of the “I’m a Mormon” campaign for The Church of Jesus Christ of Latter-day Saints, of which he is a member. He and his wife, Amber, are the parents of five children. This page was last edited on 11 October 2015, at 22:43.